Love this comforter! It is 100% cotton, what makes it more breathable and cozy! Colors are more vivid and more beautiful than the ones shown in the screen. I would recommend this comforter to a friend! Bring a touch of charm and style to your bedroom with the Waverly Key of Life Reversible Comforter Collection. This statement collection features a whimsical take on a traditional floral in a fresh color palette. Reverse features coordinating multicolored dot print. Shams are fully reversible with hidden zipper closure. Comforter set includes one reversible comforter, one coordinating bed skirt, and two coordinating pillow shams. Dimensions 110.0 In. X 96.0 In. Love the colors in the comforter.my walls are a bar harbor beige color and the colors match perfectly.The room has gone from ok to an upscale tranquil sanctuary. Thank you Overstock for your great selections you made shopping fun again. Excellent quality. The comforter I ordered is a king and is oversized on my California King bed. So much better than others that aren't quite long enough. This is a nice comforter and is a very good weight, not like the cheap ones that seem flimsy. I have not put the bed skirt on the bed because it will not hang right because of the construction of my bed. I didn't like the look of this set when it was still in the package. I almost sent it back. Then I put it on my bed and I changed my mind. The colors are a little different then I expected. However, I blame that on my imagination and not enlarging the image before I purchased it. I also purchased 3 pairs of the curtains that match. We purchased this comforter for our mom’s assisted living apartment along with the drapes and valence. Her bedroom is stunningly beautiful. The comforter is made very well made of high quality fabric. It fit perfectly and looks great on the queen sized bed matched with teal colored lamps on the bed side tables ...the colors are as pictured - very pretty. I highly recommend the comforter and the coordinating pieces. Comforter set was nice, but the colors in the picture are not accurate. The bed skirt appears to be checkerboard, 2 colors-red and white, but it isn't. It is 4 colors and not a woven fabric but a print. Still pretty, just a bit disappointed. The comforter set is excellent quality and has beautiful bright colors without being overpowering. It really brightens up a room and gives you lots of options for adding other pops of color to coordinate. The quality of this comforter is outstanding. I buy a king sized comforters for my queen size bed, but this was actually so large it almost touched the floor on both sides. The background color was much darker tan/chocolate color than I had thought so I ended up returning it because of the size and the color. Puffy, soft, full. Much more tHan what I had expected for the price. The skirt is lovely. Shipping was free. I will definatEly order again from overstock. Very satisfied. it is very pretty. I was not expecting it to be so thick and heavy. It will be to warm other than winter for where I live. "Is there Floral decorative pillows that also match the comforter along with the solid pillows....I do not see an option to purchase them like the solid pillows??" 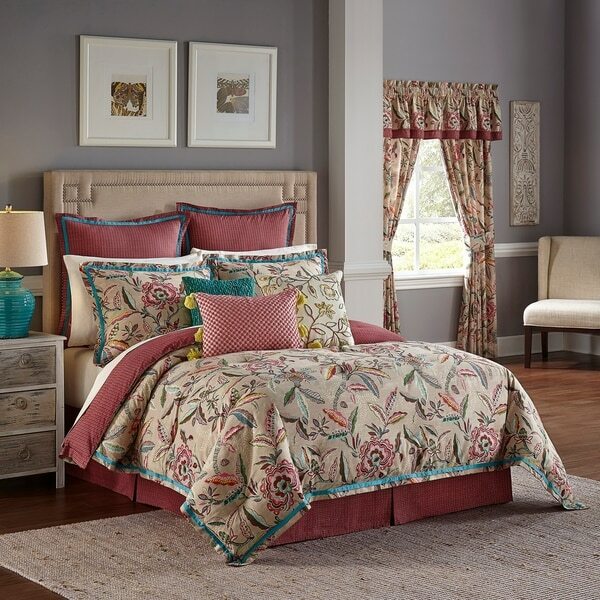 The floral decorative pillows are sold separate, from the Waverly Key of Life Comforter set.